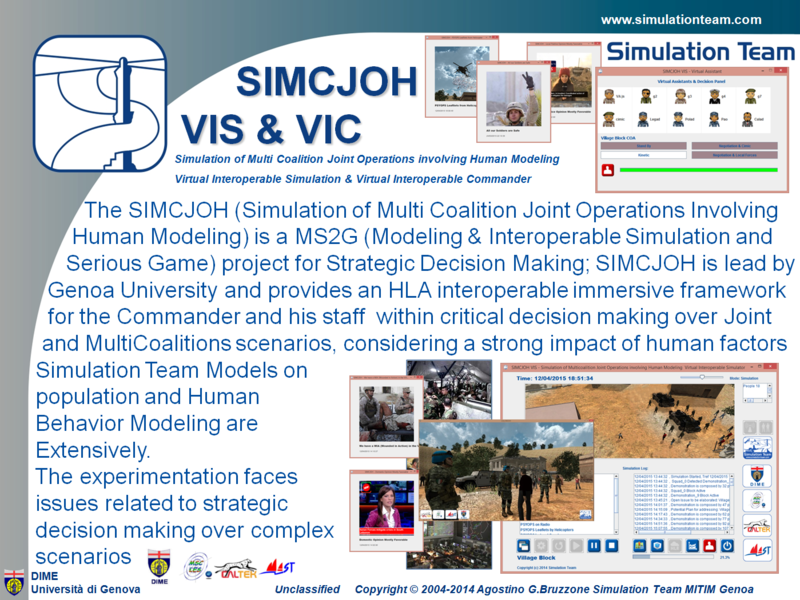 The SIMCJOH (Simulation of Multi Coalition Joint Operations Involving Human Modeling) is a MS2G (Modeling & Interoperable Simulation and Serious Game) project for Strategic Decision Making. 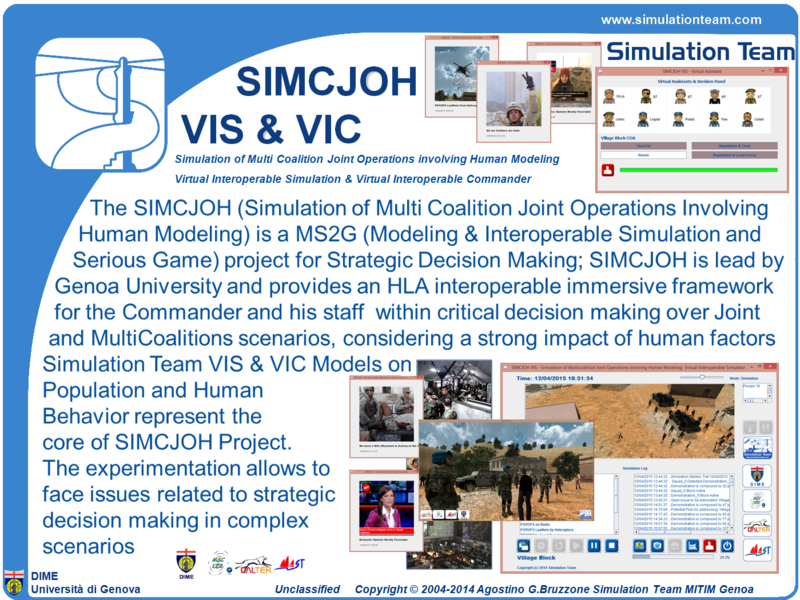 SIMCJOH project is lead by Genoa University and provides an HLA interoperable immersive framework for the Commander and his staff within critical decision making over Joint and MultiCoalitions scenarios, considering the strong impact of human factors. Simulation Team Models of Population and Human Behavior Modeling are the Core of SIMCJOH Project. 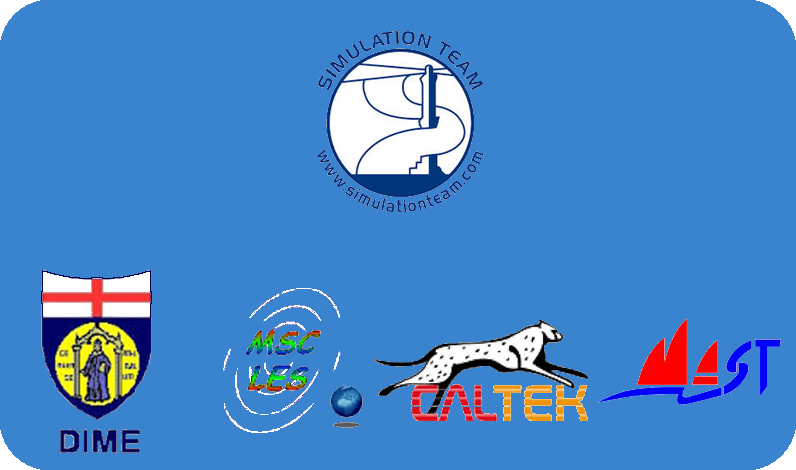 SIMCJOH VIS and VIC are the core of SIMCJOH Federation and simulators and have been developed by Simulation Team DIME Genoa University, MSC-LES, MAST and Cal-Tek. The experimentation faces issues related to strategic decision making over complex scenarios. The SIMCJOH VIS & VIC have been tested integrated in SIMCJOH Federation with Simulation Team IA-CGF; the SIMCJOH Federation includes also Selex ES SGA, CAE GESI. The SIMCJOH Project was create to demonstrate the use of these elements in a HLA Federation, the project was co-sponsored by Italian MoD and demonstrated in Italian M&S Centers and NATO M&S Center of Excellence through a joint cooperation involving DIME Genoa University MSC-LES, Cal-Tek, MAST. The SIMCJOH VIS & VIC have been tested also integrated with SGA Selex ES and GESI CAE.